Research plays a big part in locating a lesser known and disputed tor and, on this occasion, this entailed looking at the writings of William Crossing, Eric Hemery, Terry Bound, Mike Brown and Ken Ringwood. Tim also had his own candidate and so we intended to explore all possible outcrops to solve this conundrum. 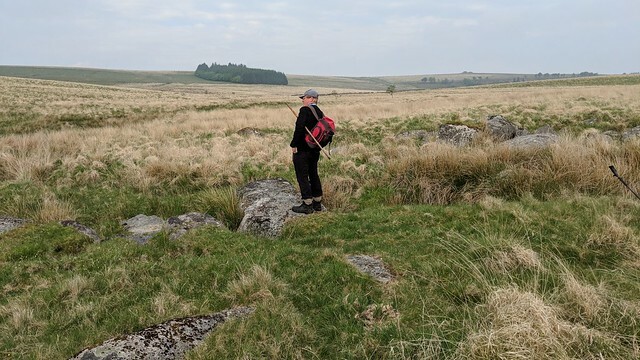 First stop was to Mike Brown's "Gazetteer of Dartmoor Names" for a grid reference. With SX 61??71? ?, it is clear he wasn't sure, and it failed to narrow down the area for our search. William Crossing is the first to mention Strane Tor. 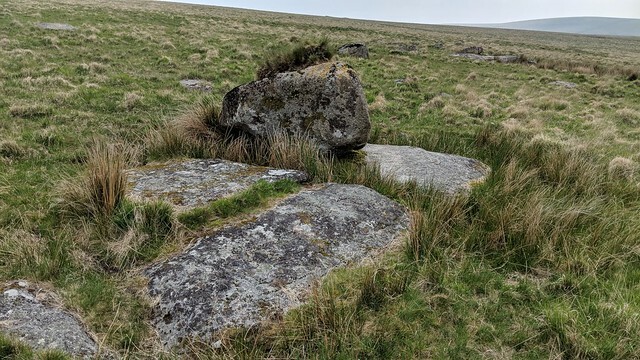 In his book "One Hundred Years on Dartmoor p.122", he states that it is; "A small tor on the Strane, a tributary of the Swincombe." 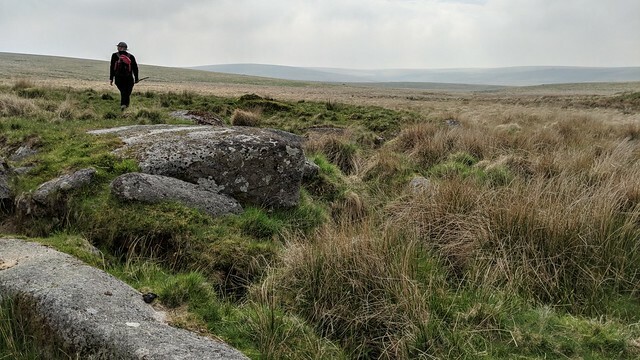 In "Guide to Dartmoor (Southern and Western Section) p. 21", Crossing provides an additional clue to the tor on the River Strane; "This stream joins the Swincombe below the White Works (Ex. 3). Above its L. bank is a small pile known as Strane Tor." I should make it clear that the true left bank of a river is determined by the direction the river is flowing downstream. So to clarify, if a walker is going upstream, the true left bank would actually be on the right. On the ground, we started our search from Strane Head. I figured it a good idea to explore from its source below Royal Hill. 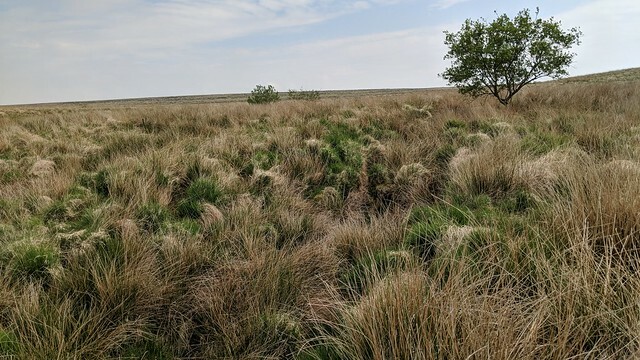 It's an uninspiring depression, a mixture of long grass and dried sphagnum moss, crying out for the forecast rain to rejuvenate it. We loosely followed the course south to where it meets another, larger stream to become the Strane River. 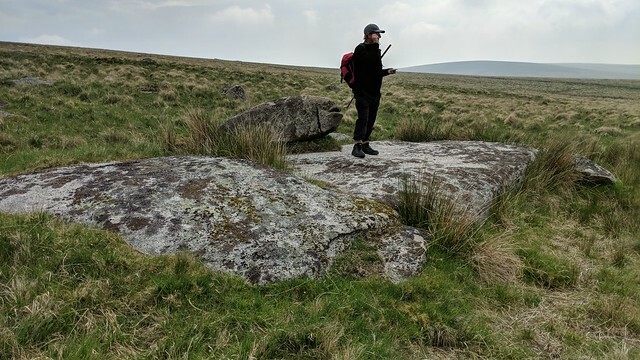 Terry Bound, in "The A to Z of Dartmoor Tors" was clearly disappointed and unconvinced with the location yet still gave a grid reference of SX 612718 for Strane Tor. 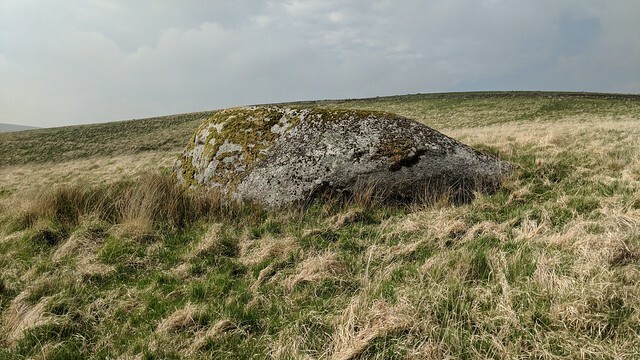 His description gave two candidates but favoured the latter one, albeit reluctantly; "There are two possibilities in the area that can covert the title; one is a scattering of medium sized boulders found on the east bank of the Strane. Neither of them could in any way be described as a tor, outcrop or pile. These are seen to the north-east of the footpath from Whiteworks 100 metres from it. The slightly more probable Strane Tor is further upstream, roughly 300 metres from the rocks and nearer the water. 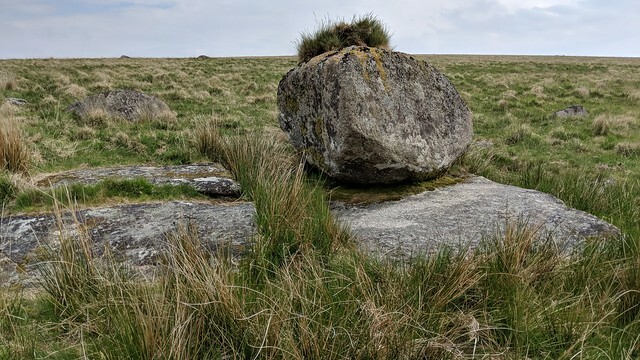 A small cliff-like formaton, barely two metres high, with grass on top amid other larger rocks, similar to flat tor but smaller, is seen from the west bank north-east of the big boulder on the opposite bank." Ken Ringwood in "Dartmoor's Tor and Rocks p.184". appears to have gone with Terry Bound's suggestion at the confluence. He says; "There are a few granite blocks on the bottom of the hill, to the East of the Strane River.." Crucially, a grid reference is an eight figure one; SX 6114 7188. Apart from being a poor specimen, the location begs the question; "Why would someone bother to name this pile in the middle of nowhere?" We moved on, like Terry Bound, unconvinced. It was time for us to move further downstream. We crossed the river to visit a fine boulder that I had originally visited a few years ago, thinking it must be the location. It is a far more impressive rock, but is not a tor, just a boulder and likely the one that Terry Bound mentions. We now moved for the next candidate. Enter the Tim Jenkinson choice. 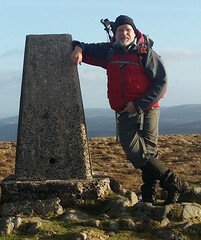 In an article in "Dartmoor Magazine winter 1998, p.31" he called it a lost tor and gave his find a grid ref of SX 615714. The photo of the two outcrops didn't convince him but the location was more in keeping with Hemery's description. Tim admitted it was "not hardly a tor just some large boulders." Eric Hemery, in High Dartmoor p. 343 attempted to decipher Crossing's account of the location, but left us with a similarly vague description; "Downstream, the valley narrows between Strane and Peat Cot Hills, on the lower slopes of which two diminutive rock-piles and clitters oppose each other across the river. 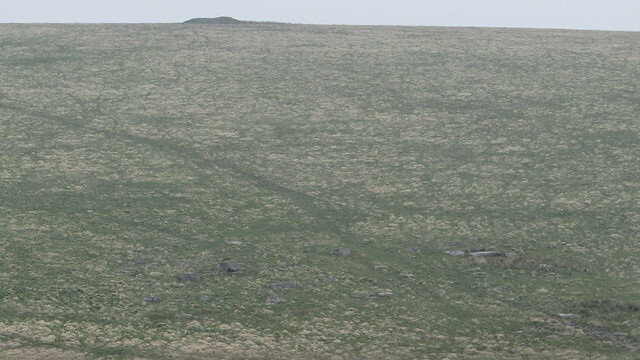 Crossing writes, without indicating its position in the valley, that above the "river's left bank is a small pile known as Strane Tor", a name not now used." The issue with this description is that it isn't obvious where "Strane Hill" actually is! The hill on the true left bank rises to Royal Hill, but perhaps one of its spurs, to the south of its summit, where a cairn was located, was what Hemery called Strane Hill. Later, I see that Mike Brown confirms this with a grid reference of SX 6271. We had crossed the river to head for Tim's rocks, when we spotted, on the other bank up the hill, some granite bedrock standing out. We recrossed the Strane and made for it. To our right, further downstream, we could see a wide ford and track that ascended the hill, passing our goal. It was promising that, in this valley of very little landmarks, this thoroughfare went so close, as it would have likely made this small pile significant enough to be named to aid navigation. Reaching it, we found two fair sized sections of bedrock and a charming rock that resembled a fish. Surveying the scene, buoyed by the ford and track, we could see Tim's candidate on the other bank and began to realise that we had found where Hemery's "two diminutive rock-piles and clitters oppose each other across the river." 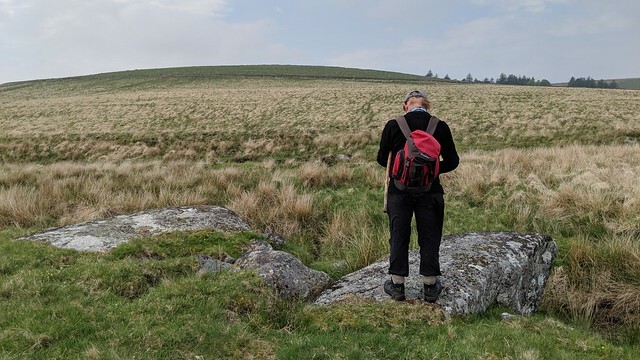 With the "tor" we were now stood on being on the lower slopes of what must be Strane Hill, we believe we have found the correct location for Strane Tor at SX 61527 71661. We left the modest tor, crossing the ford, to visit Tim's candidate, which I have now recalled "Diminutive Rocks". Looking back to Strane Tor, it cannot be seen. If we hadn't just been there, we wouldn't have even known it existed, so I can see why Tim didn't seek it out when he was last here. We were fortunate that we were approaching from the right direction on this occasion. 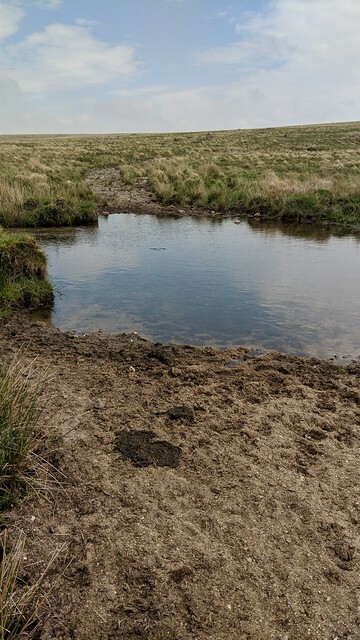 Returning to the car, we looked back from Peat Cot Hill, at the scene, where the ford, and Strane Tor could be seen from afar, with the track rising up over Strane Hill, with a large cairn atop. 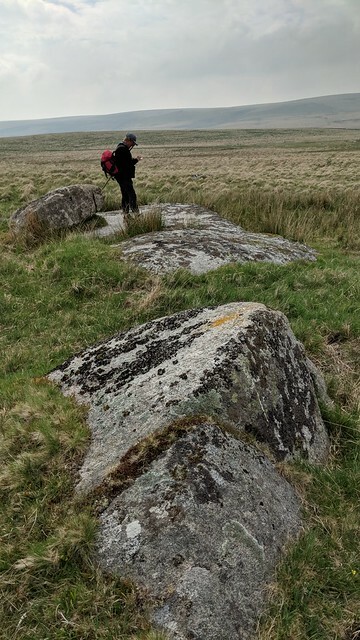 Summing up, we can be certain that Hemery had described the scene well and thanks to him we had found the correct Strane Tor. But the lack of grid references didn't make it easy. 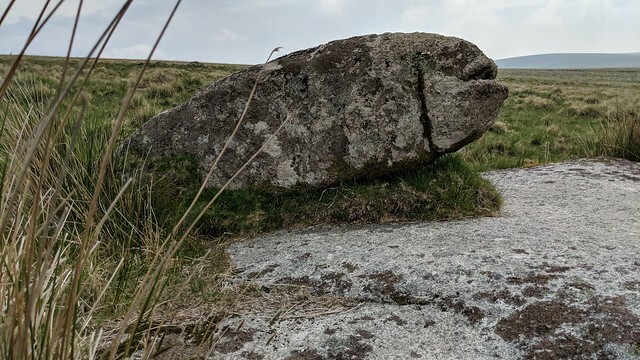 In "High Dartmoor p.6" he explains that "Map references are not used, being alien to a book of this nature: to explore the context is to appreciate better the centre-piece - to sense, in fact, the character of the environment. Similarly, the musical-score-reader can be given bar references to find particular features in a symphony, but heard apart from its context they are only of narrow musicological interest. The feature, whatever it is, can only make its true impact upon the searcher who seeks for it in the context within which it is set." Strane Hill, with the tor on the lower slopes, cairn on the top.